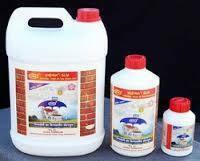 Pioneers in the industry, we offer Termiban Anti-Termite Chemicals from India. In construction industry, termite is a serious problem for wooden structure. Until now toxic compounds like aldrin are used to get rid of this problem. Toxicity of these compounds poses threat to environment that is why the use of aldrin has been banned by who (world health organization ). Now other compounds substituted are also toxic. All these compounds falls under the poison category. These are to be stored, handled and applied with many instructions. Even empty containers etc. Are to be destroyed carefully. These compounds repel the termite from the area where it is applied, but the wooden chowkhats grouted in floor are not protected against dampness. And chowkhats get decayed due to dampness and water. Secondly, ants also destroy this portion of chowkhats. Moreover the treatment of such compounds is effected for limited period as such recurring expense is there. Termiban is available in two packs. After mixing, it is to be applied on wooden structure. On setting a very hard, transparent film is formed. This film or coating is not attacked by termite or other insect. So it has banned the termite to harm the wooden structure. This coating is resistance to water as well as acid. It is not poisonous product. Therefore it is totally safe during storage, handling and application. And no inhaling risk to workers. The coating is highly durable almost permanent, so there is not recurring maintenance expense. The coating is to be applied on the portion of wood, which comes into contact with masonry structure, or to be grouted in floor.